This morning AMD is taking the wraps off of their next line of video cards, the Radeon RX 500 series. 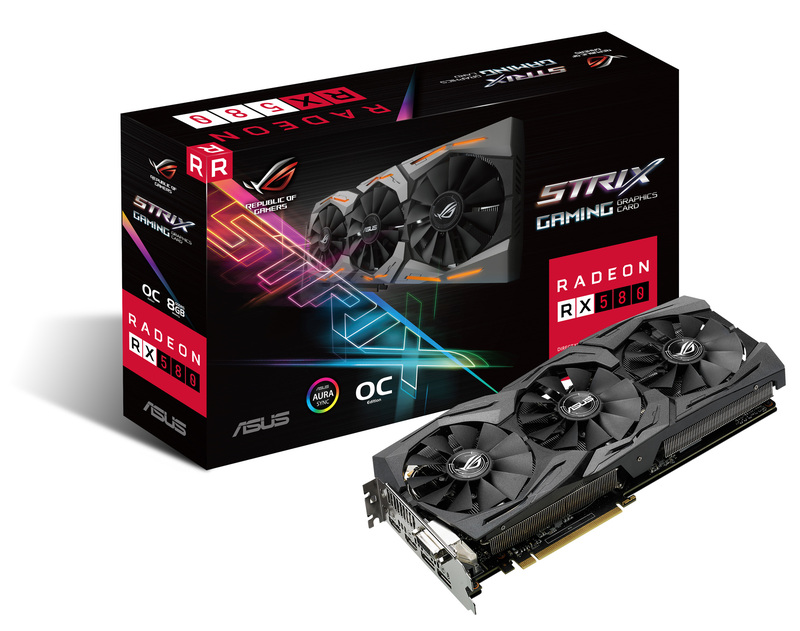 Like past video card lineup refreshes, the RX 500 series is based on AMD’s existing GPU architecture, Polaris, but shipping in new configurations and at new prices in order to boost AMD’s GPU performance and their competitiveness. This gives AMD and its partners something new to sell for 2017, while at the same time also giving them something even faster to tempt current 300/200 series owners into upgrading to Polaris. Adding an extra wrinkle into all of this, there’s even a new Polaris GPU joining the family, albeit at the low end. In prior generation refreshes such as the Radeon 300 series, AMD has bumped up clockspeeds while tweaking prices, and the Radeon RX 500 refresh is no exception. 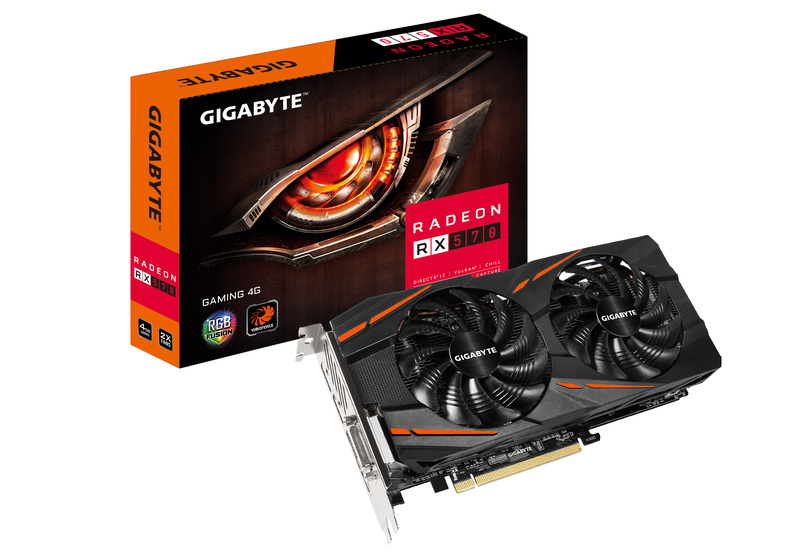 For the cards based on upgraded versions of existing RX 400 SKUs – primarily the RX 580 and RX 570 – clockspeeds and TDPs are up. Meanwhile towards the lower end of the stack, we’re finally getting a full-enabled Polaris 11 card in the RX 560, or below that, a new low-end GPU in the form of Polaris 12, which is going into RX 550. However this refresh also deviates from the course a little bit for AMD, as they haven’t been sitting completely idle on the GPU front. The RX 500 series is using new revisions of the existing Polaris 10 and Polaris 11 GPUs. These revised chips have received further tweaking to reach higher clockspeeds, while also fixing a couple of minor issues with the GPUs. In the case of the latter, AMD is adding a new mid-power memory clock state so that applications that require memory clocks faster than idle – primarily mixed-resolution multi-monitor and video decoding – no longer cause the memory to clock up to its most power-demanding speeds, keeping overall power consumption down. Meanwhile on the manufacturing front, all of the revised Polaris chips are being manufactured on what AMD is calling the “Latest Generation FinFET 14” process. This is a bit of a mouthful, but in short it’s AMD calling attention to the improvements partners GlobalFoundries and Samsung have made to their 14nm LPP processes in the last year. Yields are up and overall chip quality is better, which improves the average performance (clockspeed & power) characteristics of the chips. Both foundries have also been making other undisclosed, small tweaks to their lines to further boost chip quality. Typically these kinds of yearly gains would simply be rolled into a product line without any fanfare – these improvements are gradual over time anyhow, not a binary event – but for the RX 500 series AMD wants to call attention to them to explain why clockspeeds are improved versus the RX 400 series cards released last year. Though to be clear here, the difference isn’t dramatic; the gains from a year’s optimization to a manufacturing line are a fraction of a full node improvement. One thing to note here is that while AMD’s chip quality has improved here, for the desktop AMD is investing virtually all of those gains into improving clockspeeds. Consequently, TBPs are actually going up relative to the RX 400 cards, as AMD looks to maximize their performance-per-dollar ratio. To get a better look at the numbers, please take a look at our RX 580 review. Moving on, as I mentioned earlier, AMD’s target market for the new RX 500 cards is owners of existing 28nm cards such as the Radeon 300/200 series, as well as NVIDIA’s GTX 900/700 series. The actual performance gains over the RX 400 cards are only around 5%, so this isn’t meant as an upgrade for owners of those cards. Instead the added performance is meant to further entice 28nm owners who didn’t bite on the RX 400 series. 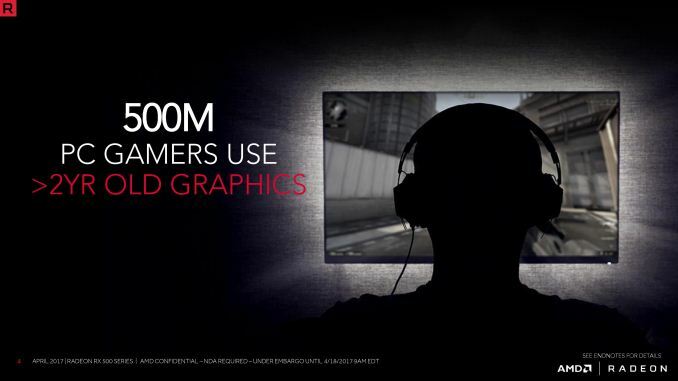 AMD is continuing with their play for volume with the RX 500 series, so they are eager to grab what they estimate to be the 500M gamers who are still on video cards more than 2 years old. Diving into the cards themselves, we have the RX 580, RX 570, RX 560, and RX 550. These cards will extend from $79 up to $229, launching in waves over the next month. At the high end is AMD’s new midrange contender, the RX 580. Like the RX 480 before it, this is a fully enabled Polaris 10 GPU. Taking advantage of their manufacturing gains, AMD is bumping up the boost clock by 6%, from 1266MHz to 1340MHz. Meanwhile the base clock – which has proven somewhat arbitrary on Polaris since it rarely throttles anywhere near that much – is increasing by 12%, from 1120MHz to 1257MHz. As we’re seeing in our RX 580 review, expect the performance gains to closely mirror the boost clock changes. Otherwise when it comes to power, there’s no such thing as a free lunch; TBPs have increased from 150W to 185W in order to allow RX 580 to reach these clockspeeds. In the case of this SKU, AMD is investing all of their manufacturing gains (and then some) into clockspeeds. Which given the outcome of the RX 480 versus the GTX 1060, shouldn’t be too surprising, as it’s clear that AMD isn’t going to beat NVIDIA on efficiency with Polaris. The RX 580 is launching today. 8GB cards will start at $229, while 4GB cards will start at the all-important $199 price point. Since vendors can reuse their existing factory overclocked RX 480 designs – and indeed, AMD doesn’t even have a reference RX 580 design – board partners are hitting the ground running on factory overclocked cards. These cards have even higher clockspeeds, some on the order of 1400MHz or more, with higher TBPs to match. Board partners do prefer factory overclocked cards due to their higher margins, so I’m not sure just how many cards will actually be available at $229/$199 today. Finally, the competition for the RX 580 will be NVIDIA’s GeForce GTX 1060 6GB, which as of late has been starting at the same $229 price as the RX 580. In terms of performance the GTX 1060 6GB comes out ahead of the RX 480 in most scenarios, so this is the gap AMD wants to close with the higher clocked RX 580 cards. 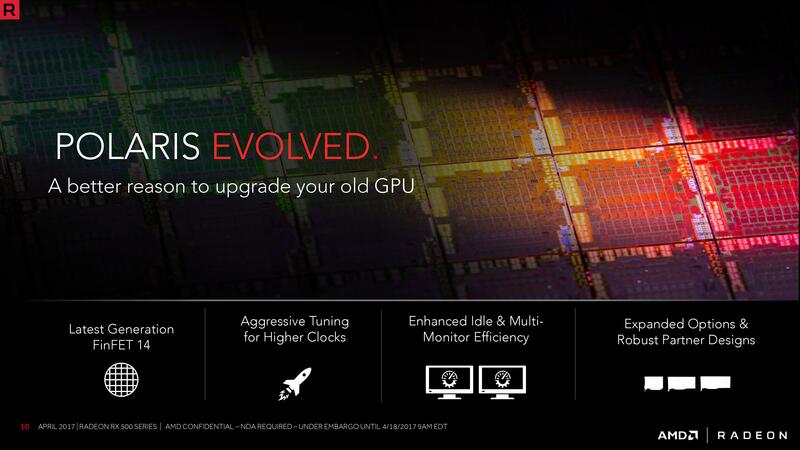 Though it’s a fine line for AMD to walk, as it doesn’t leave AMD with much (if any) of a price advantage. The target market for the RX 580 will be a mix of 1440p and 1080p gaming. Polaris 10 isn’t quite powerful enough to do no-compromises 1440p gaming across the board, and RX 580 can’t fix that (this will be Vega’s job). But it can handle 1440p on some games, and will scream on 1080p for everything else. Next up is the Radeon RX 570. Like its more powerful sibling, this is an enhanced version of its RX 400 series predecessor, the RX 470. We’re looking at the same cut-down Polaris 10 GPU with 32 of 36 CUs enabled, but again clockspeeds are increased. RX 570 goes from 1206Mhz to 1244MHz on the boost clock, a 3% gain, while the base clock is increased from 926MHz to 1168MHz, a gain of 26%. Moving on, TBPs have increased for the RX 570 as well. 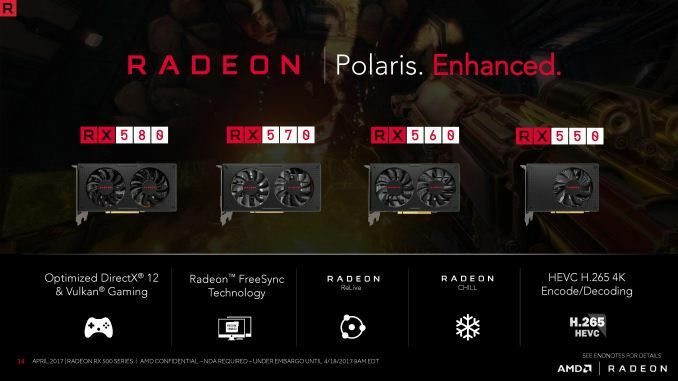 Whereas the RX 470 was a 120W card, the baseline for RX 570 will be 150W in order to drive the Polaris 10 GPU at higher clockspeeds and to power throttle less often. For board partners, this means they can either use the reference RX 480 as a starting point, or as many of them will be opting to do, use their existing designs for factory overclocked RX 470/480 cards and build from there. The RX 570 will be launching at $169, $10 cheaper than where the RX 470 launched last year. Perhaps more importantly, this means there’s now a $30 gap between the starting price of RX 570 4GB cards and RX 580 4GB cards, which helps make the different SKUs stand out a bit better. Like the RX 580, the RX 570 is launching in volume today. Expect board partners to hit the ground running on factory overclocked designs, particularly to take advantage of the fact that RX 570 is starting from a lower clockspeed than RX 580. Otherwise the competition for the RX 570 is a mixed bag. AMD considers the GeForce GTX 1050 Ti the primary competition for RX 570, however the cheapest GTX 1060 3GB cards have been starting close to $169 for a bit now. So depending on stock and NVIDIA’s pricing, the GTX 1060 3GB will more often be AMD’s competition. The target market for the RX 570 is 1080p gaming. In this capacity it should be able to tackle most games without compromise, though it doesn’t quite have the steam to sustain 60fps Ultra on every last game.